One of the features that you must consider when buying a good stand up paddle board are the dimensions. These numbers may appear insignificant to you, but they mean more as they determine the performance of your board at different levels. For your knowledge, we have rounded up some important dimensions that you need to consider, which includes, length, width, volume, item weight, and rider weight. In selecting the right stand up paddle board for you, consider the local conditions of where you wish to paddle. You need a different length board for optimal performance if you consider riding the ocean waves or cruising on a calm lake. This specific dimension is also important to consider when storing it in your vehicle or at home. Convenience in walking towards the water is also important in considering what length to choose. Here are the various lengths of stand up paddle boards from which you can choose. These boards are suitable for surfing as they provide easy maneuvering capacities as compared to long boards. Since they are short, they particularly fit children who want to learn paddling for the first time. They are designed perfectly for versatile use. You can use them for leisure activities or for touring/racing purposes. You can ride these boards on tranquil waters and surf the rugged waves in the ocean. As compared to short and medium boards, long boards offer the highest speed. This is because they are inclined to track in a straight direction. If you want to race or tour around a lake or in a bay, then you must have a long board to help achieve the speed and miles you need. 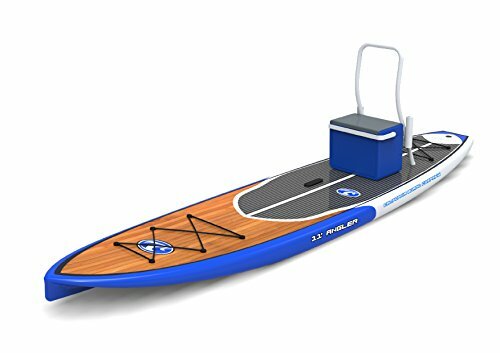 California Board Company does it again with the release of the California Board Company 11 ft. Angler Fishing Stand up Paddle Board. This 11 foot board really gives you what you need to catch the next big fish. The V-Hull alone keeps you in the right direction; allowing for great casting. Buy today! This specific dimension determines the stability of a stand up paddle board. The highest width can reach up to 36” to hold different body sizes. These boards run fast as compared to wide boards, which is why they are preferred by racers. However, they tend to be less stable compared to wide boards. This is why it fits those experts in paddling because they already have the skills to balance this board, but if you are beginner, this may not be the fit for you. If you want more stability, a wide board is the right item for you. This is much preferred if you are beginner because you’ll need all the stability to keep afloat. This also works great if you want to stand on it. However, they may not be as fast as narrow boards. This determines the buoyancy of the stand up paddle board with weight on it. There is a positive relationship between the volume and the weight capacity of the board. As the volume gets higher, the weight that can be supported by the board is also higher. If you weigh 200 pounds or more, choose a higher volume that can support your weight much more effectively. Never settle for a low-volume board because you’ll have a hard time paddling your way into the water. However, if you weigh less than 200 pounds, then you can settle for a low-volume board. This dimension determines the weight of the actual board. A lighter board is much preferred to give you ease when you carry it around on the shore. It will be a hassle if you end up dragging your board on the sand. A board which weighs less than 30 pounds is bearable. Stand up paddle boards have a rider weight limit in their specifications. Make sure that you take a careful observation on this because it determines maximum weight that it can carry. Always choose a brand that has a bigger rider weight than your actual weight. In this way, you’ll be guaranteed that you’ll float on the board and not submerge like a rock. If you weigh 150 pounds, select a board that offers more than a 150-pound weight limit capacity. Leashes & lifejackets save lives! Why not show safe paddling behavior in all of your pictures? A beginner may see the picture and assume no safety equipment is necessary. Paddling deaths are increasing. If we ALL model safer behavior maybe we can change that. Thanks Bob. We appreciate the sentiment and have several articles on equipment. The unfortunate reality is most stock photos cater to aesthetics and it is increasingly difficult to find good shots with proper safety gear. In addition, your environment drives said gear. For instance, sometimes you want an ankle leash and sometimes you want an upper body leash.